I travel to Tahiti several times a year to photograph Teahupoo, catch up with friends of old and partake in the finest of local cuisine 'poisson cru'. Teahupoo is unique perfection wrapped in many layers of consequence, a reef break you never want to argue with. A reef that sits in the Pacific that's in the direct firing line of storms from the Southern Ocean. This, my surf loving friend, results in long periods of swell (which can be interpreted as) 'the bigger the period of swell, the greater the power'. Chopes, while still being divorced from the effects of the weather that initiated the swell, is the perfect coincidence. Conditions peek and the epic swell sees the early morning commute down to 'The End of the Road'. Ten to twelve hour days being drenched by spray and tossed around in the channel, but I wouldn't swap it for the world. I love it when a big swell hits, with one of the more memorable being 2011 'Code Red' and that ridiculously dangerous ride by Nathan Fletcher, and the more recent Point Break swell of 2014 (of which I will be featuring later this year). A juxtaposition of sweet perfection and bitter consequence. Black and white photography has the beauty to distill an image to its purest form, stripping back, almost naked, to the essence of the photo. In a world of over saturated imagery, the simplicity of the basics will take you back to the content revealing the unadulterated power of a single wave. WORLD’S BEST WAVES: Searching the planet for waves is the life of surf adventure photographer Ted Grambeau. For 4 decades his quest to photograph the most spectacular waves in the world has taken him to some of the most remote regions of the globe. 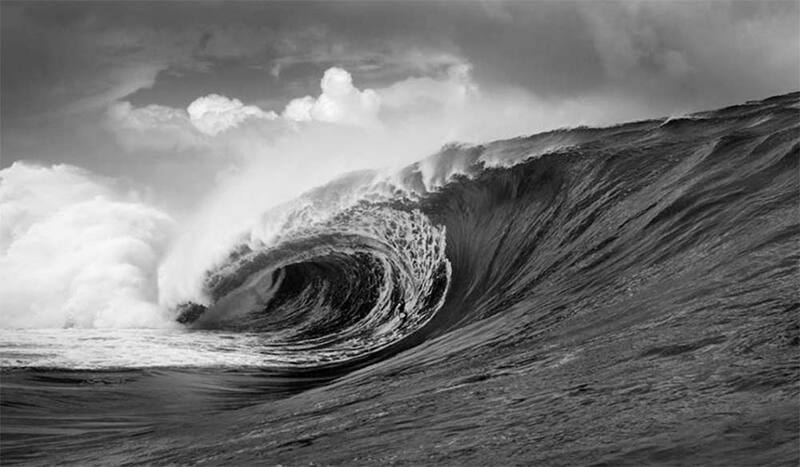 This collection of wave prints of spectacular surf moments, the world’s most dangerous waves. Perfect Teahupoo and large slab waves from the southern ocean of Australia.